First up, Floral Solaire (or Golden Floral), the fourth release from niche line Filles des Iles. 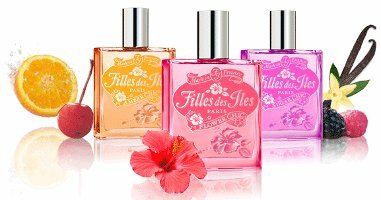 Filles des Iles is the latest venture from the same team that brought us the strikingly unconventional fragrance Dinner by Bobo — remember that one? It was once described, somewhere (sorry I can’t remember where), as meat served by a sweaty waiter. This time around, they’re doing rather conventional tropical florals, which presumably have more widespread appeal. Floral Solaire, developed by perfumer Celine Ellena, is described as “an expressive, teasing and fascinating scent”, and features notes of cedrat, star fruit, tropical breeze, passion fruit, lily, tiara, orchid, flamboyant, amber, benzoin, soft sand, musk and vanilla.